At the end of about any meal in Tuscany, being it at the restaurant or at home, you'll be offered with Cantucci and Vin Santo. 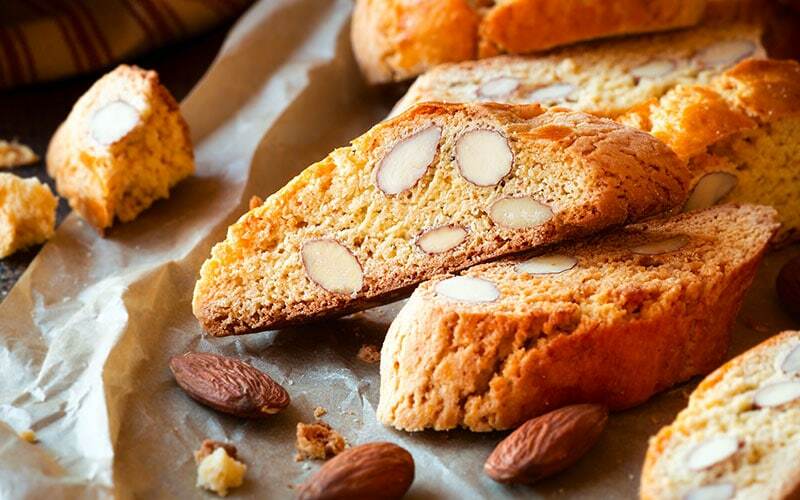 Italian Biscotti or Cantucci are crunchy almond biscuits, traditionally dunked in Vin Santo - a sweet Italian dessert wine, but you can accompany them with also with Tea or Coffee. Typical of Tuscany, they can now be found everywhere in Italy and abroad being one of the most famous Italian sweet treat. Cantucci or Biscotti, that is the question. First of all, let's clarify a thing. Biscotti in Italy literally means "cookies", so if you ever come to Tuscany and ask for Biscotti you could receive any kind of cookie - or blank stares, since it's pretty uncommon to eat Biscotti after dinner or lunch. What Americans call Biscotti are here known as Cantucci or Cantuccini (if they are small) or Biscotti di Prato, after the town where they come from. From the Middle Age onwards, cantucci were small loaves of bread with Fennel or aniseed. They were twice cooked (literally, bis-cotti) in the oven in order to prevent them from spoilage and ensure a longer conservation. Even if they were pretty different from the nowadays version, already in the Renaissance they were dunked in sweet wine. To meet the modern Cantucci Tuscan had to wait until 1858 when Antonio Mattei opened its Cookies Factory in Prato. Hence their name, most of modern cookies are not cooked twice any longer. Tuscan Cantuccini, however, are still given a second blast of heat, making them ideal for dipping, maybe in a glass of Vin Santo. Vin Santo - literally Holy Wine - is a viscous, typically sweet dessert wine made in Italy, predominantly in Tuscany. The wine is loved for its intense flavors of hazelnut and caramel. As the cantucci, the tradition of this wine is very old and the reasons behind its name are shrouded in mystery even if it may be due to the on the timing of the fermentation of Vin Santo grapes around Easter in the spring. Another story has it that, in the Middle Ages, a Franciscan friar used altar wine to save people from the Black Death. Believing it to be miraculous, the Tuscan populace quickly named it Vin Santo. Whatever version you prefer, Cantucci and Vin Santo is the perfect end of any Italian Meal. When you lean back from the table after a delicious – and filling – meal, sometimes the last thing you want to consider is a creamy dessert. 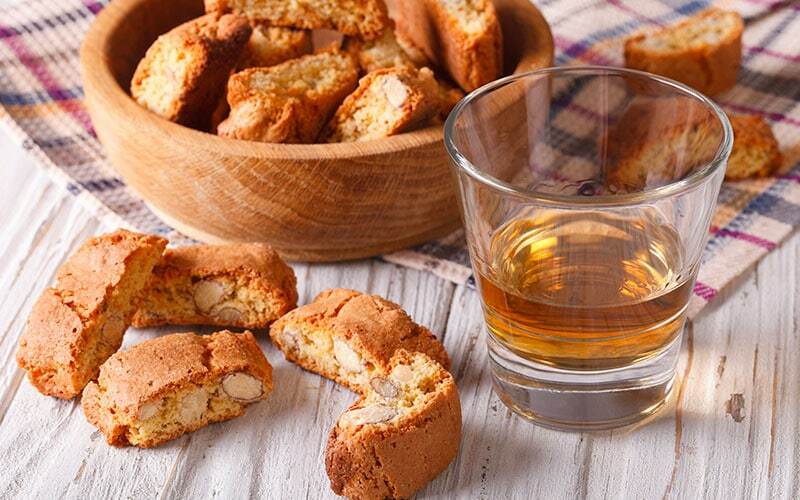 Sipping a glass of Vin Santo accompanied by a couple of Cantucci will definitely satisfy your sweet tooth without make you feel fuller. Cantucci: there's something to suit everybody's fancy! Cooked in an elongated loaf shape, they are cut diagonally, thus creating the famous initial and final pieces, called precisely cantucci in Tuscany. The traditional version is with Almonds but nowadays you can find Cantucci to suit everybody's fancy! With Pistachio, Chocolate, Orange... That was the aim of Fratelli Lunardi: to make a delicious, soft biscuit for daily eating, suitable at any time of the day. For this reason, they reworked the recipe, adding butter and playing with other ingredients, coming up with seven different flavors, four of which feature Chocolate. 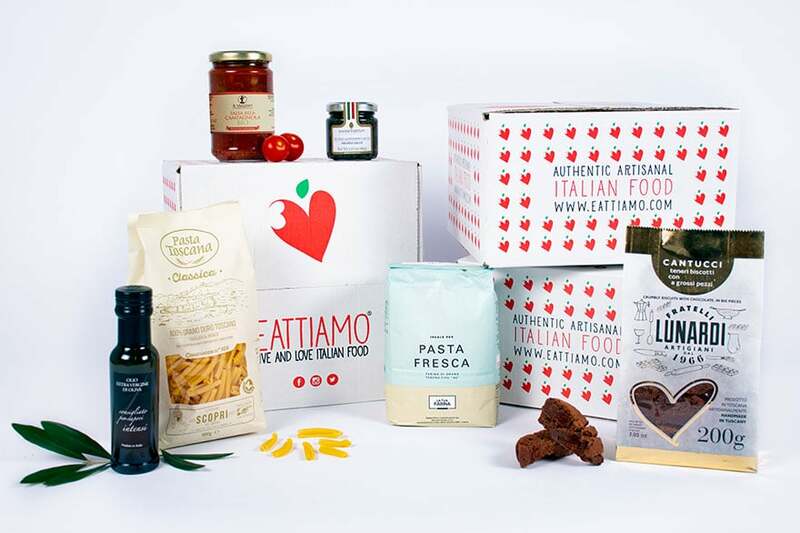 Using the finest products, observing their seasonality and finding the best ways to preserve them naturally, allows Fratelli Lunardi not to use preservatives, additives or artificial colourings, which subdue the wonderful diversity of natural flavours. 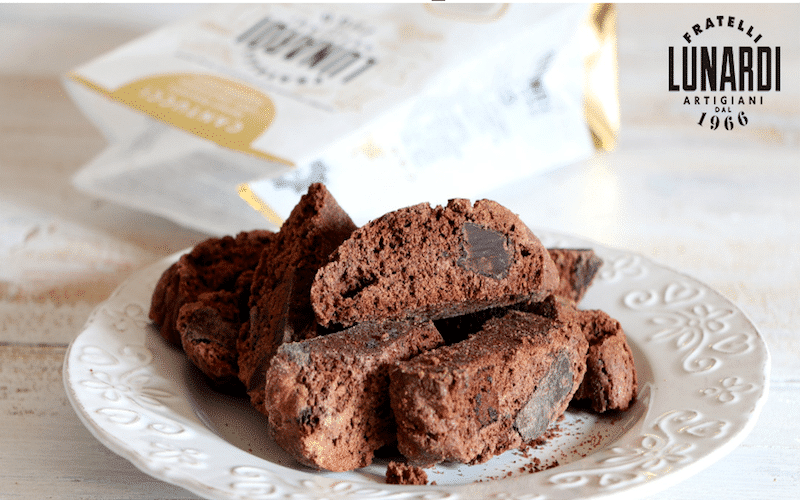 Our Taste of Tuscany Box features their tender Chocolate Cantucci , a tender biscuit with cocoa and big chunks of chocolate. "Let me reveal you a secret", Paola from Fratelli Lunardi said when we called her to know a bit more about this fantastic cookies "you can dip them in Vin Santo, Coffee, Milk or Tea… or you can prepare a special, super-easy dessert." "Heat your Chocolate Cantucci for a few seconds at the lowest temperature in the micro-wave. By doing this, the butter and the chocolate in your cookies will free their fragrance and their aroma. Then, spread them with a bit of orange marmalade and serve it with a dollop of whipped cream. It's like a Cantucci-version of the Sacher Torte!" Massimiliano and Riccardo parents' have owned a bakery for more than 50 years. The family tradition together with the incredibly strong passion for food in general, led them to create a brand with their faces and name: that's how Fratelli Lunardi was born. Their production is based on the concept that when an ingredient is a top-quality one, it should be respected and used in a recipe that enhances instead of altering it. Discover them in our Box!